For the crust, dissolve the yeast in to the water in a mixing bowl. Mix in the salt, oil, and flour and continue mixing until well combined. Shape dough into a ball and coat surface lightly with olive oil. Return to mixing bowl and place in a warm area for about 1 hour until dough rises. Then, punch the dough down. Roll the pizza dough out on to a round pizza pan or baking sheet sprayed with nonstick cooking spray. Pre-bake the crust in a 400 degree oven for about 10 minutes so it is about halfway done. 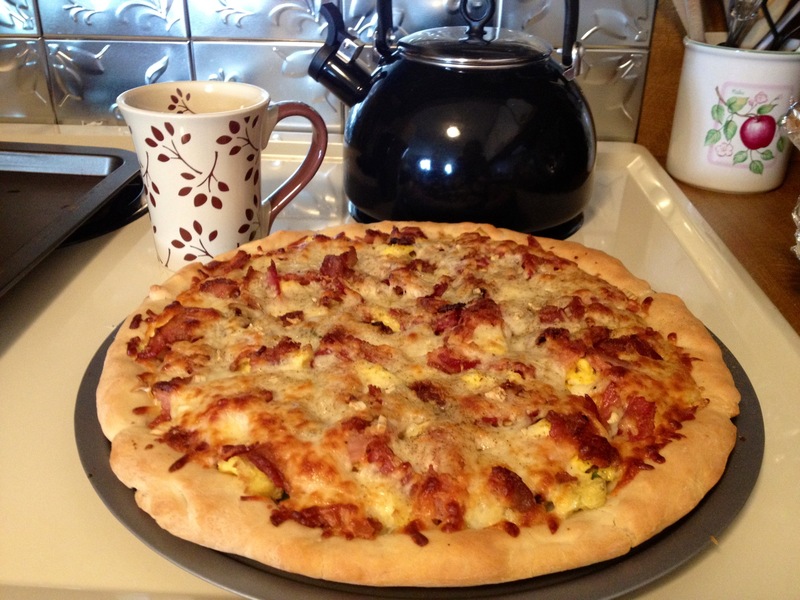 Remove from oven and layer peppers, onion, eggs, and bacon on top of crust. Season with garlic, salt, and pepper. Top with shredded mozzerella cheese. Return pizza to oven and continue baking at 400 for an additional 15 minutes or until crust is crispy and cheese is melted. and obviously this recipe is just as good with cooked, crumbled sausage…yum!! !